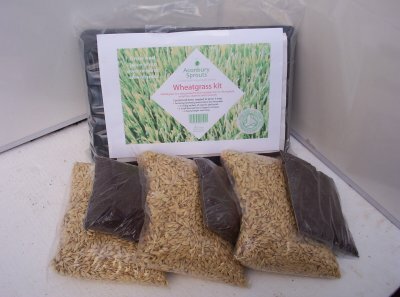 This is an excellent starter kit to growing our own organic Wheatgrass, Barleygrass or Spelt grass. Growing in soil is the easiest way for the novice. When growing it hydroponically, we cannot add compost, while in soil, the compost can provides the grass with added nutrients. The usage of ��Sprout Bag��is suggested pre-sprouting the seeds before transferring to compost. The growing process can be sped up and the germination rate can be increased in this way. Another way is to use a sprouter to pre-sprout if you have already owned one. Then the Sprout Bag is not included with this kit but can be put below. Soak the seed 1 cup/250grams wheat grain = 1 tray (approximately) for 3-12 hours in a cup/glass or simply put them straight into the sprout bag, dip the whole bag "seeds n all" into some water. Use a jar covered with a porous cloth secured with a rubber band instead of the Sprout Bag if you don��t have it. This is also for easy rinsing. Remember to rinse quickly with fresh water after soaking. Then, hang on a hook or knob or lay it in the dish rack. If you use the jar, do not forget to drain out the water and keep on an angle so that it will drain completely. Rinse them twice per day, generally 12 hours apart, until the little white shoots appear (regular rinsing helps to keep seeds moist while they are germinating). Then, you can begin to plant wheatgrass. Using a bleach free paper to line the bottom of the tray to prevent roots from protruding through the holes in the bottom and also avoid the soil falling through the tray (optional step). Fill the tray with soil/potting mix, which should be damp until it is approximately 3cm deep and then pat down well. Spread the seed evenly and gently on only a single layer. The living environments do not need strict requirements. They can be put inside or outside. But, wheatgrass can grow well in filtered sunlight instead of full sun. Thus, the place near a window is a good position because natural sunlight is best there. It is important to take care it on the hotter days because wheatgrass can get burnt tips or wilting in hot direct sunlight. In order to keep the soil always moist, it is better to water it at least once a day using a light to medium spray. Then, the bottom soil and the roots can get the water. When the seeds are very young, it is better to water it twice a day. The seeds may die before they get a chance to take root if they dry out. Putting some material (e.g. an old sheet that has been ripped up, or newspaper) over the top of the tray until the shoots are 1-2cm high can prevent seeds from drying out.Remember to keep the covering damp all the time. TWhen the wheatgrass is approximately 12cm long, we can get its harvest. With a serrated knife or scissors, cut it right down to the seed and then put them into juicer. However, if you have any gluten allergies, do NOT juice the seeds. The cold press juicer instead of a masticating or centrifugal juicer will need to juice wheatgrass.